AANS – American Association of Neurological Surgeons - Founded in 1931 as the Harvey Cushing Society, the American Association of Neurological Surgeons (AANS) is a scientific and educational association with more than 8,600 members worldwide. The AANS is dedicated to advancing the specialty of neurological surgery in order to provide the highest quality of neurosurgical care to the public. The NERVES annual meeting is held immediately prior to the AANS annual meeting in the same host city. CNS – Congress of Neurological Surgeons - The CNS exists to enhance health and improve lives worldwide through the advancement of neurosurgical education and scientific exchange. The CNS has over 8,900 members worldwide. CSNS – Council of State Neurosurgical Societies – The Socio-Economic arm of the AANS & CNS. 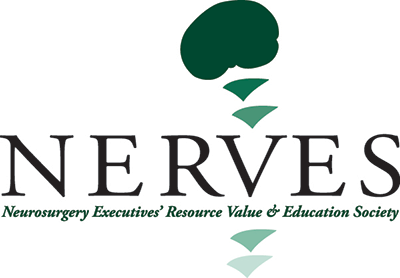 NERVES was formed by the CSNS in 2002. Two NERVES member sit on the Executive Council of the CSNS, and two surgeons from the CSNS sit on the NERVES Board. Neurosurgery Blog – The mission of Neurosurgery Blog is to investigate and report on how healthcare policy affects patients, physicians and medical practice and to illustrate that the art and science of neurosurgery encompasses much more than brain surgery. Washington Committee – The AANS/CNS Washington Committee develops and promotes organized neurosurgery’s positions on issues affecting the specialty. Through advocacy, policy development, and public relations, the Washington Committee and the Washington Office work vigorously to defend and protect the ability of neurosurgeons to practice medicine freely — and to help ensure the continued advancement of the specialty of neurological surgery. NeuroPoint Alliance – NeuroPoint Alliance (NPA) was established in 2008 by the American Association of Neurological Surgeons to collect, analyze and report on nationwide clinical data from neurosurgical practices using online technologies.